3x stronger than regular screen protectors! Optimum protection for your Galaxy S8, with a superior hardness rating, scratch resistance and a smudge-preventing oleophobic coating, keeps your screen pristine. Don’t risk a smashed screen! Your phone is one of your most important possessions. Keep the screen protected against smashes, scrapes and scratches by using the Premium Tempered Glass Screen Protector. Its surface hardness rating of 8-9H is three times stronger than a regular PET film screen protector and effectively dissipates impact over the tempered glass surface if the phone is dropped or hit. 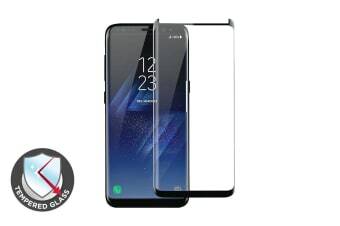 With scratch resistance and an oleophobic coating that prevents smudges and fingerprints, the Premium Tempered Glass Screen Protector has you covered. An included application kit, microfibre cleaning cloth and coloured button protectors make it easy to keep your phone looking brand new!